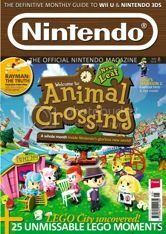 Animal Crossing: New Leaf: Official Nintendo Magazine Animal Crossing New Leaf Exclusive Look! Official Nintendo Magazine Animal Crossing New Leaf Exclusive Look! Check out this great edition of the Official Nintendo Magazine. There is an 8 page feature about the upcoming Animal Crossing: New Leaf game. Very interesting to read and packed full of screenshots and good commentary; albeit the writer did not seem to be much of an AC fan. On the plus comes with a free poster/yearly planner! This is a really great magazine. The AC:NL review was very well thought out and insightful.